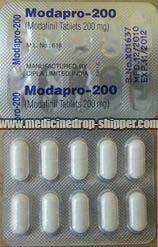 We are a highly renowned Supplier and Exporter of Modapro 200 mg Tablets in Maharashtra, India. We offer them to the leading hospitals, health care centres, and pharmaceutical stores, all over the globe. These are precisely composed by our esteemed vendors, who meticulously adhere to the set industrial standards and norms. These tablets are available in a high-quality packing material, which protects them from contamination.